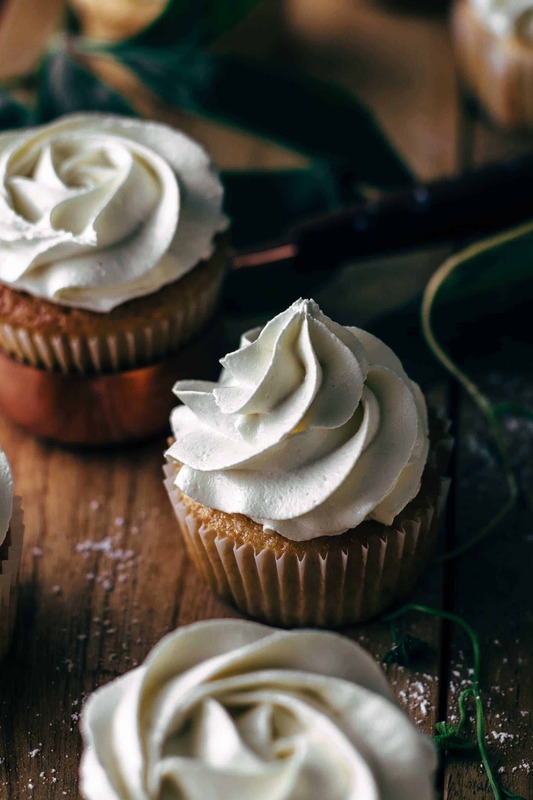 These White Chocolate Cupcakes with White Chocolate Frosting are beyond delicious and easy to make. 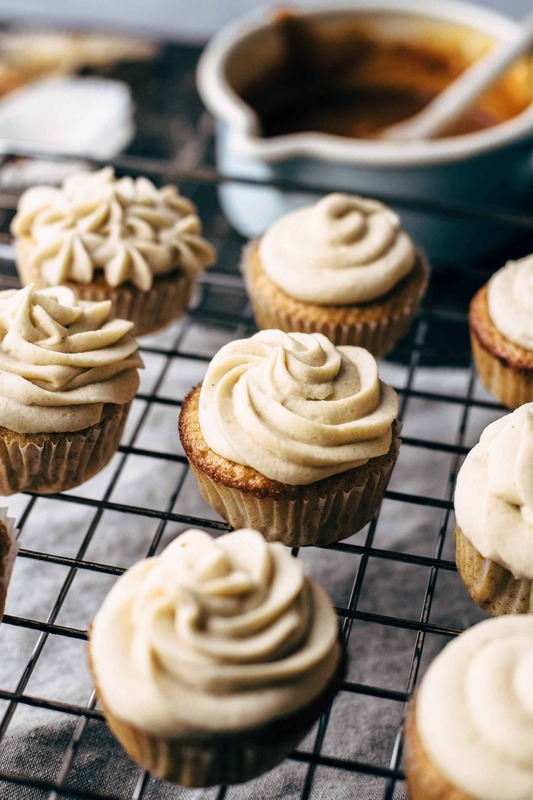 The frosting is super creamy and the cupcakes super fluffy. White chocolate lovers: this recipe is for you! Are you a fan of white chocolate? 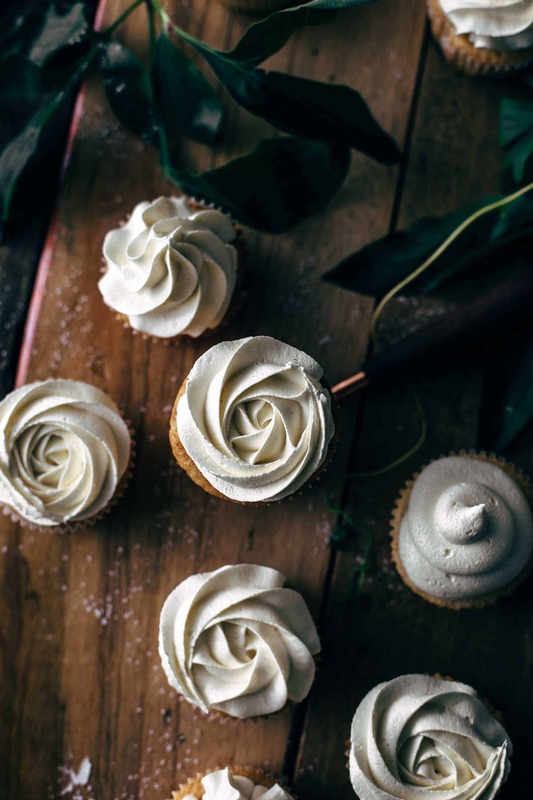 If not (now), I think you will join us white chocolate lovers, once you tried these White Chocolate Cupcakes with White Chocolate Frosting. I love white chocolate. But almost all chocolate recipes on my blog are with milk or semi-sweet chocolate. This has to change. White chocolate deserves to be in the spotlight either. Awesome! I’m super thrilled right now. So let’s start. 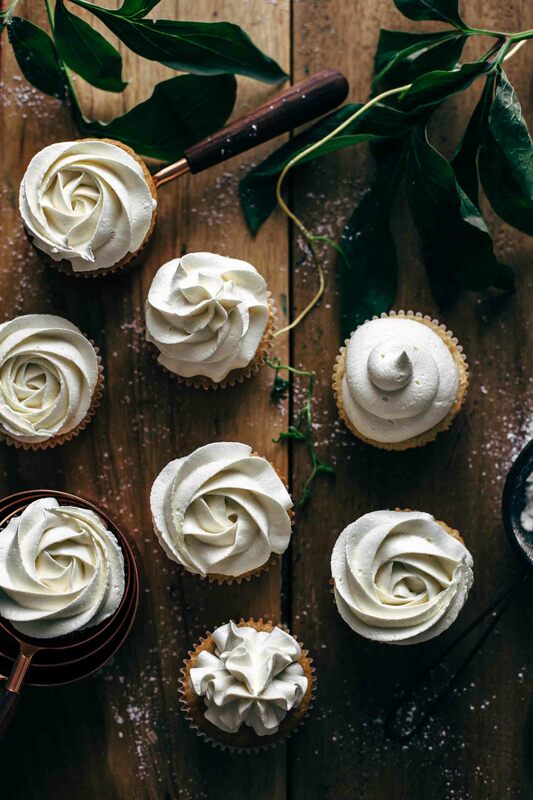 Good news: this white chocolate cupcakes recipe is very easy to make. Start with melting the chocolate. Melt it for about 2 minutes in the microwave and stir every 20 seconds to prevent it from seizing. Then let cool down that it is not hot anymore when adding to the batter. The batter will be thick but liquid. 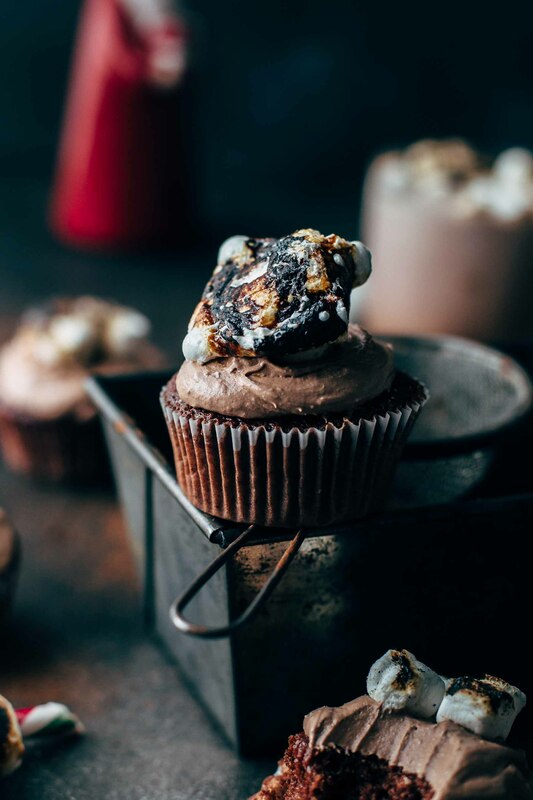 The best way to fill it into the cupcake liners is with an ice cream scoop. Fill the liners just 2/3 full. If you fill them up too high, they will sink or spill over the sides. And if you care about how the cupcakes look like in the end, stay with about 2/3 filling. Depending on how much you fill them, the baking time needs to be adjusted. The same is true if you fill them lower than 2/3. After baking let them cool down to room temperature before you frost them. 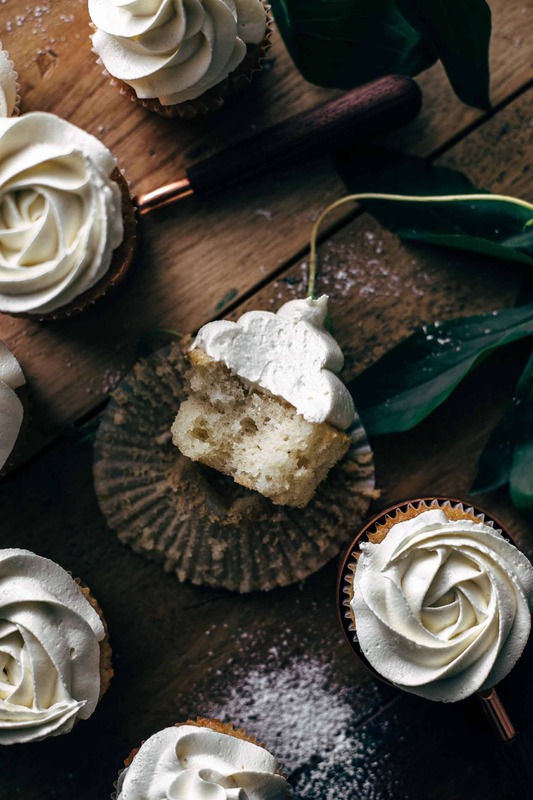 These white chocolate cupcakes are super light and airy and loaded with white chocolate taste. You could eat them also without frosting (Mario did this) because they taste super delicious on their own. Guys, you know how much I love marshmallow frosting. Marshmallow frosting is by far the frosting what I make the most. This white chocolate frosting literally drives me crazy. It is the CREAMIEST frosting I’ve ever had. Seriously. Start again with melting the white chocolate and let it cool to room temperature. Then mix soft butter until it is super creamy for about 5 minutes. Add sifted powdered sugar and stir until smooth. Then add the white chocolate and salt and stir until smooth, silky, and creamy. The salt cuts down the sweetness. You remember that I said that you could eat the cupcakes without frosting? What do you think what happened to the frosting from the cupcakes Mario had? Ok, I’m not proud of myself for saying this now. But yes. I spooned the leftover frosting without anything. What should I say… IT WAS AWESOME!! As you can see, I’m a huge fan of frosting my cupcakes differently. For the frosting techniques you see, I used a star and a round piping tip. With the star tip (1M Wilton) I piped three different shapes as you can see in the photos above and below. To pipe a rose, start in the middle of the cupcake and pipe the frosting in a circle from the center to the edges evenly. Stay at the same high. The frosting will form nice layers like a rose. You could also pipe a swirl. Therefore, start again in the middle of the cupcake and pipe frosting in a circle from the center to the edges and back again to the center without stopping in between. Lift the piping bag upwards when moving back to the center that you pipe the frosting in a swirl on itself. This piping technique works with a star and a round piping tip. Watch the video below to see how to pipe a rose and a swirl. The third shape you could pipe with a star tip is the easiest. Place the tip in the middle of the cupcake and apply more pressure than at the other techniques. Stay in the middle and move the tip slowly and straight upwards. The frosting will form lovely ruffles. 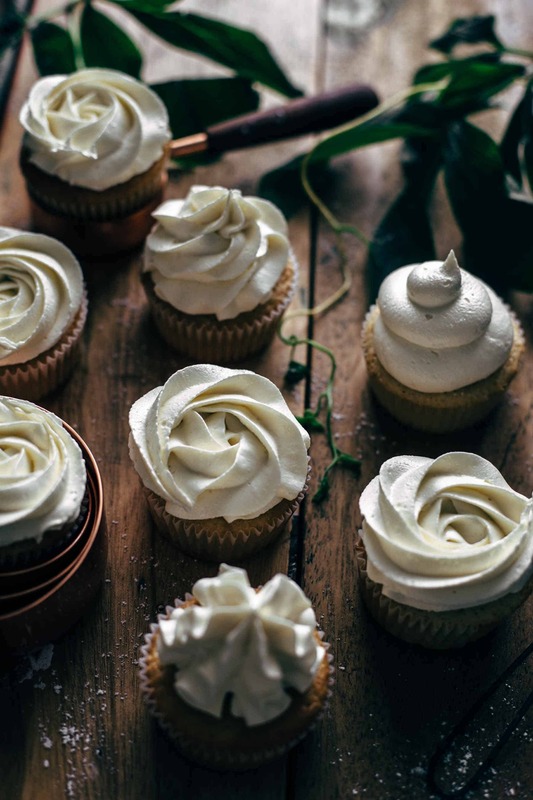 Which frosting technique do you like the most? 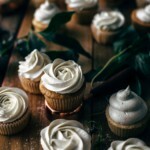 If you try this White Chocolate Cupcakes with White Chocolate Frosting recipe leave a comment, rate it and tag a photo #alsothecrumbsplease on Instagram! Would love to see your snap! 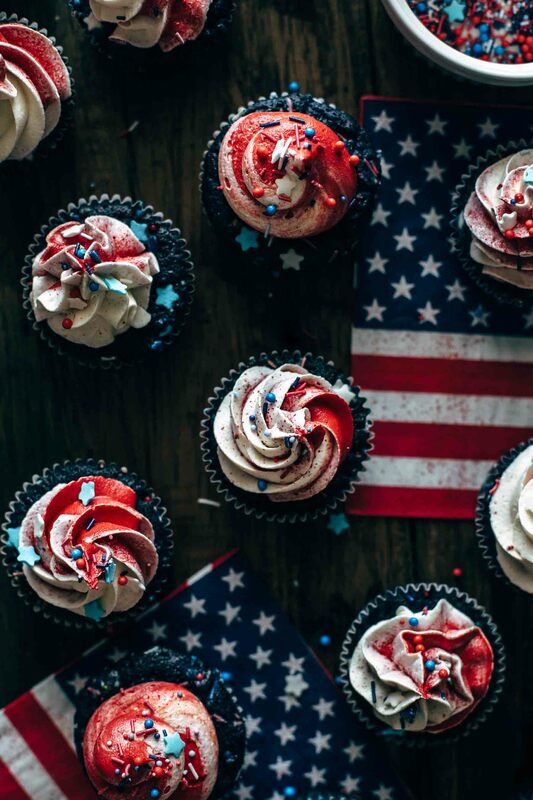 You may also like Easy 4th of July Cupcakes Recipe, Salted Caramel Vanilla Cupcakes, Perfect Hot Chocolate Cupcakes, Irresistible Soft Fluffernutter Cupcakes, or click here to see all recipes. Preheat oven to 350°F (175°C). Line two 12 cup muffin pans with 16-17 cupcake liners and set aside. Stir flour, baking powder, and salt together in a small bowl and set aside. 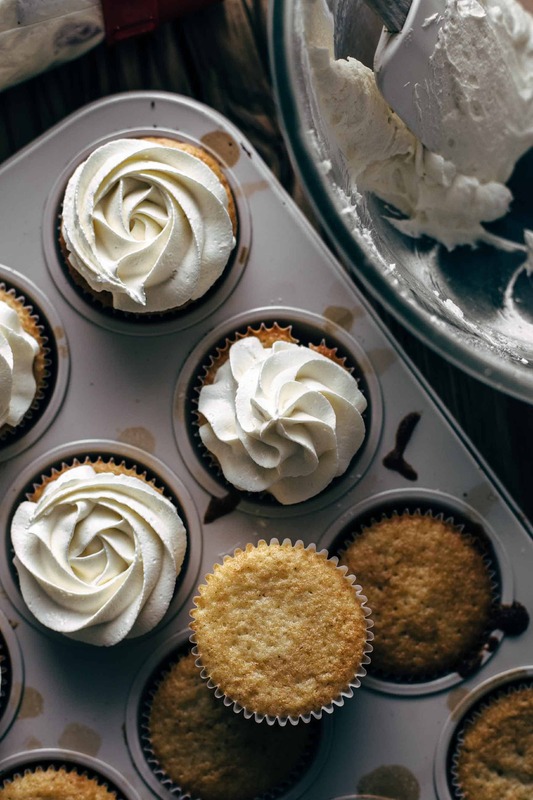 White Chocolate Cupcakes: In a large mixing bowl using a stand mixer or hand mixer fitted with a whisk or paddle attachment, beat egg and sugar on medium speed until creamy, for about 2 minutes. Add oil, white chocolate, and vanilla* and stir until smooth. Alternately add dry ingredients and buttermilk. Beginning and ending with dry ingredients. Mix on low speed and just until combined. Spoon batter with an ice cream scoop into the liners and fill maximum 2/3 that your cupcakes don't sink or spill over the sides. Bake for about 17-20 minutes or until a toothpick centered in the middle comes out clean. I baked mine for 18 minutes. Let cool to room temperature before frosting. 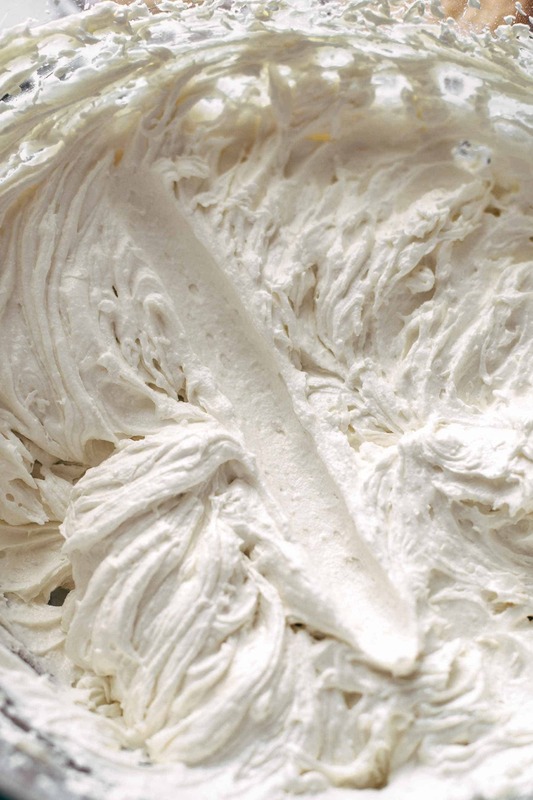 White Chocolate Frosting: Beat butter on medium-high speed until soft and creamy, about 5 minutes. Add powdered sugar and beat on medium-low speed until fully combined and smooth. Add chocolate and salt and mix on medium speed until combined and creamy. 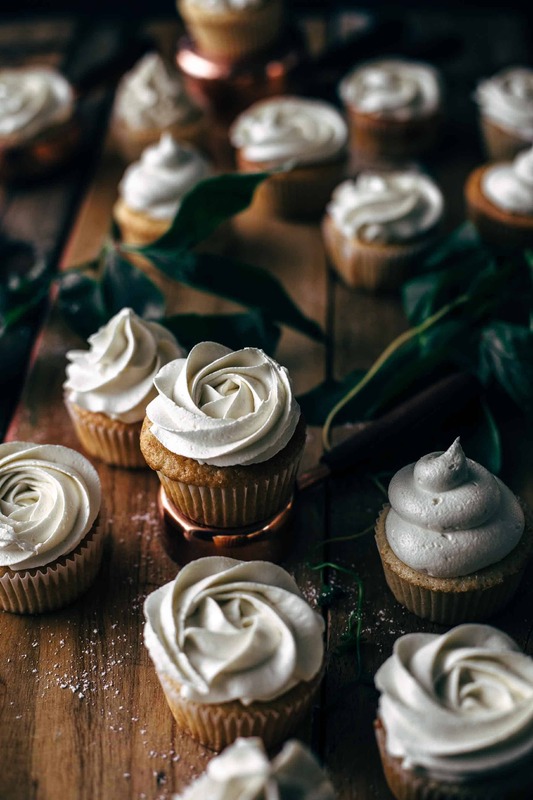 Frost cupcakes and store in an airtight container at room temperature for up to 3 days. For frosting techniques inspiration, read blog post above. Greate Dish I love cooking and food. Very tasty and delicious recipes…. Thank you so much, Maha! Hi! I love all your recipes and use them regularly. I was just wondering if I can use this recipe to make a cake and if you think it will still retain that light and fluffy texture? I’m super happy that you like my recipes! To be honest, I’ve never tried to make a cake out of this recipe. I guess it would work but you would need to double the ingredients to make a three or four layer cake and maybe you bake them in two or three 8″ pans. The baking time will be depending on how much cake pans you take, about 20-35 minutes but check with a toothpick. Because they are really fluffy it could be that they are too fluffy to hold its stand with the buttercream. If you want to make a white chocolate cake I recommend this recipe: https://www.alsothecrumbsplease.com/triple-chocolate-ombre-cake/ Make three white chocolate cake layers instead of just one. hi there! i just made these cupcakes today and followed the recipe to a t but somehow they have a slight vegetable oil taste to them and they’re a bit dense. do you know what might have caused this? have you ever had something like this happen to you before? I’m sorry that you had troubles with the recipe. The taste of the oil shouldn’t be noticeable at all because of the chocolate. Please make sure to use regular vegetable oil with no strong taste or smell. When oil unusually smells or tastes very strong, it could be stored too warm or too long. Also, some organic oils taste very strong. So smell or taste the oil before using it. When the ingredients are measured correctly, it could be that the batter was overmixed. Overmixed cupcakes batter let gluten develop too much. They would rise beautifully in the oven and sink when you remove them from the oven. Overmixing makes cupcakes too dense. My soon to be 16 year old just sent me this recipe and said this was what she wanted at her party. Can you let me m ow that brand of white chocolate you use. I’m so excited to make these. Can the icing be made the day before? Yes, absolutely. Just store it in the fridge in an airtight container. It will get firm in the fridge, so let it sit on the counter at room temperature 1 hour before you frost the cupcakes. Can the finished cupcakes be left out for a few hours as i am bringing thm to a putluck and they will be kept on the table for a few hours before people eat them. SHould they be stored in the fridge after or do they have a shelf life in an sir tight container? it’s absolutely fine to store them at room temperature for up to 2 days when stored in an airtight container and just when it is not hot and humid in your climate zone. If it’s very warm outside then you can store them a few hours at room temperature without any problems and then place them back to the fridge. Hope that helps! Can I use cake flour instead for this recipe and if so how much? Yes, that is possible by weighing the flour. You need 120g of flour, no matter if cake or all-purpose flour. Hope that helps!